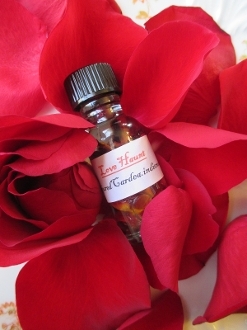 Our Products >> Love Haunt Oil-Stay On Your Lover's Mind, Permanently! This traditional southern blend aids in making you irresistible and making others, or your target, think only of you. Have a long distance relationship or are you growing apart? Use this oil and stay on their mind even when you are apart. Keeps lovers from straying and helps you make a serious impression. Use in your bath water and on your pulse point before seeing your desired partner. You can also use this oil on a red figure candle of the apropriate gender for the target. Created with my own secret herbal blend with apple, magnolia, peach and opium oils.